Our songs have been included on a couple of brand new shiny compilations. The first of these is Clarion Call, an international feminist punk album put together by American DIY label Stick-Shift Records. It features 17 great songs from bands based in the USA, the UK, New Zealand, Portugal, Brazil, France and Ireland. We’re totally hyped that “Balls” is on this great release! Digital copies are available for free (or a donation, if you prefer) from Bandcamp, and we’ll also have a handful of physical copies available at upcoming gigs. You can also find us on Fun Switch, a collection of songs by bands who have played Coventry riot grrrl event Revolt in the past year. “Intersectionality Song” is included on this one, alongside a whole load of other great songs, many of them by awesome bands we’ve gigged with in the past few months. The download is totally free. We’re playing Revolt on Saturday! It promises to be super-awesome and stuff. We’ll have copies of our latest zine, hopefully new t-shirts and other goodies. There’s a Facebook event page here and you can buy tickets here. The first will take place on Saturday 26th January in the Zephyr Lounge, Leamington Spa. We’re opening a punk night that will also feature performances from We Are A Communist, Deathsex Bloodbath and Parataxis. We’re also going to be playing Revolt! again at Taylor John’s House in Coventry on Saturday 16th March – the first event was huge amounts of fun with some amazing bands, DJs and distros, and this second night promises to be at least as good again! More details on these events will follow soon, and we’re also planning to enter the University of Warwick Battle of the Bands for a second year running – more on that when we have it! So it’s been a little while since we posted an update here, but we’ve all been pretty busy in those personal lives we lead. Still, about time there was some reflection on recent happenings. Revolt was full of awesome. The other acts were fantastic, the night had a great vibe and everything just went perfectly to plan (…which was weird, because I’ve been involved in a lot of nights and things never go perfectly to plan). There was feminism everywhere. I hear that our set went well but it was actually pretty difficult to tell from on-stage. I mostly remember some amusing false starts and trying to sing through a face full of hair. There have been some pretty cool reviews in the wake of Revolt: you can read a couple of them at Cath Elms’ blog and the Atta Girl page. We’ve also received a first review for Punk Is Not, courtesy of the Streetlamp blog. They compare us favourably to early 80s punk group !Action Pact! which is pretty damn flattering. Finally (for now!) I’d like to draw your attention to some additions we’ve been making to this website. If you click on “sound and vision” you’ll find a whole host of photos, videos (including most of our set from Notts Pride), lyrics and the like. We’ve also finally got around to scanning our second and third zines, which you can find (predictably) under the “zines” tab. We’ll be periodically updating with new photos, new lyrics and the like as people take more pictures of us and we write more songs. We’ve been making little references to Revolt for some time, and even put a hastily constructed poster for it onto the back of our most recent zine. 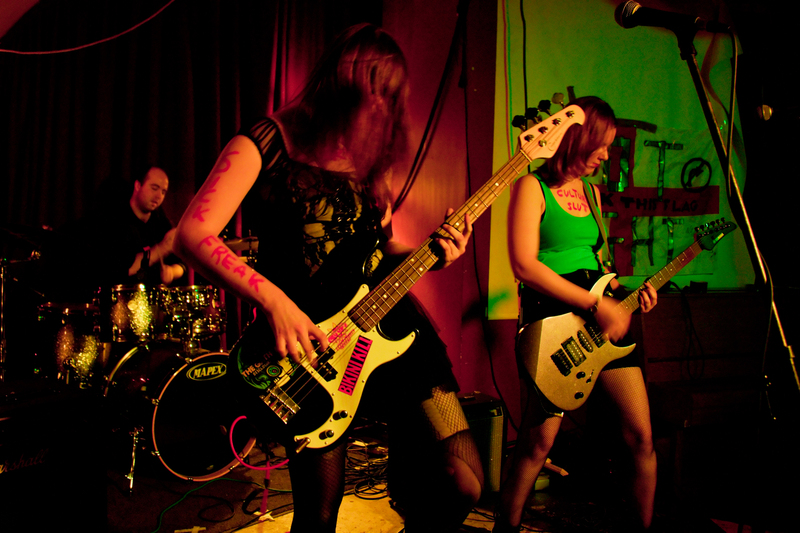 But finally, the time has come to reveal more about Coventry’s riot grrrl night! 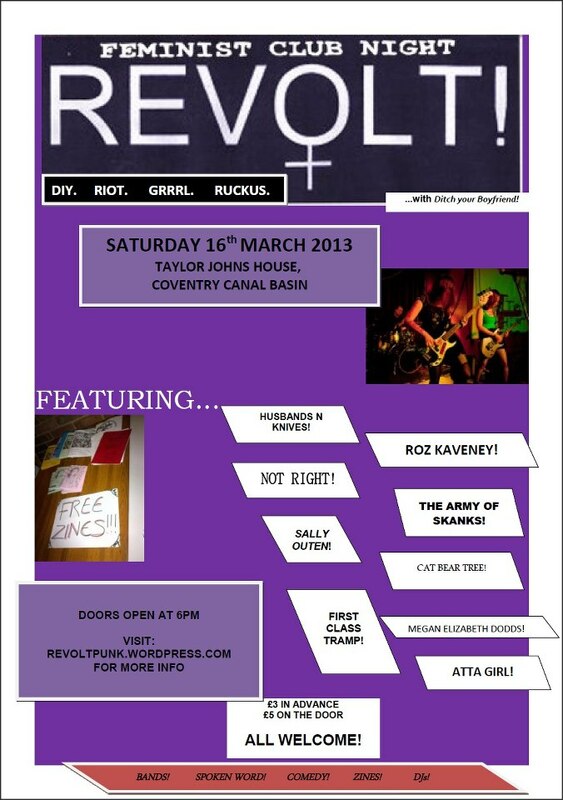 Revolt will take place in Taylor John’s House on Saturday 13th October. 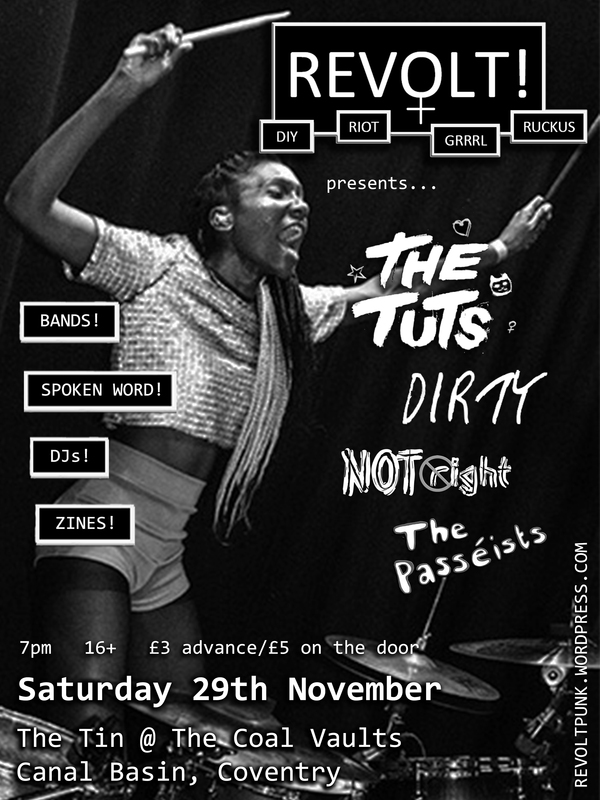 We’ll be opening the night in support of other punk bands, spoken word acts, DJs and a feminist burlesque group. Excited? Of course you are. Full details can be found on the Revolt page, which should be updated over the next couple of months as more details are announced.